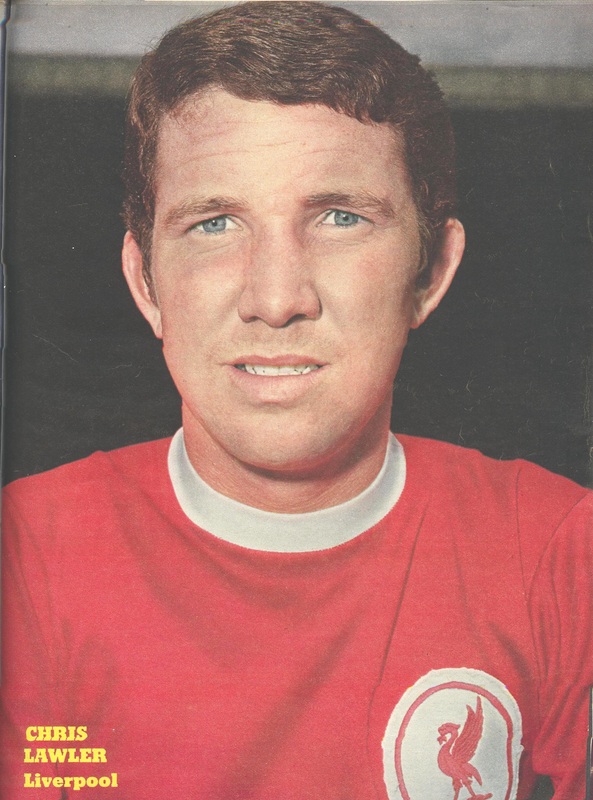 Chris Lawler - The Silent Knight - LFChistory - Stats galore for Liverpool FC! Chris Lawler’s career at Liverpool Football Club coincided with Bill Shankly’s 15-year tenure at the club, in fact, Lawler arrived three months earlier and left 16 months after Shankly’s shock resignation. Lawler wasn’t an average footballer at Liverpool FC, but quite simply the greatest goalscoring defender in the club’s history. The right-back boasts an astonishing record of 61 goals in 549 games, especially considering he was not the club's penalty kick-taker or a free-kick specialist. He ghosted into the opponents’ penalty area, having the “brain of a striker” as termed by Paisley, and dispatched the ball past the keeper. Did you ever play as a striker as a boy? No, but I did score goals. I used to like to dribble with the ball. You scored loads of goals? Yeah, when I moved to right-back. The only time I ever went forward was for corner kicks if we were losing... if we needed a goal. I was good in the air for corner kicks, especially when we played European teams, they weren’t as good then. Lawler is not one to blow his own trumpet and appears nonchalant about the knack he had for scoring goals. How did you, the local boy, come to Liverpool’s attention? I was playing for a local Catholic school. I was playing for Liverpool Schoolboys. I was captain of England Schoolboys. We played at Wembley against West Germany. I was fourteen and a half and there were 95,000 people there at Wembley and it was a good game. We beat West Germany 2-0. Martin Peters, who played in the World Cup team, was in my team as well. I could have gone to Man. United. Could have gone to Everton... I was one of fifteen children. There was eleven boys and the whole family were Reds. I was the third youngest. So they wouldn’t let me go to Everton. So my dad did say to me ‘Go up there (to Everton). 'You’re not going to sign for them but they might give you a pair of boots to try and bribe you!’ And he was right. I got a brand new pair of Adidas football boots. So after that I did my work in the afternoon and went training in the morning. And it made a big difference. When you’re with the professionals they’re giving you hints and it made a big difference to me that. So was there an immediate difference in the way Shankly ran things compared to his predecessor Phil Taylor? Yes. As soon as he came. I hardly ever saw Phil Taylor after he signed me because he wasn’t like Shankly where he was involved with the players on the pitch. He was a nice man, but not the same as Bill Shankly. He was a gentleman though. Lawler was only sixteen when he joined Liverpool and had to endure a long learning curve and was on the verge of leaving the club. He made seven appearances in the 1962/63 season when Liverpool were playing in the first division for the first time in eight years. He only featured in six games when Liverpool won the league the following season. The main problem for Chris was that his way into the first team was blocked by a giant Scotsman. I was a centre-back then in the second team. And I only played if Ron Yeats, the club captain, was injured. I thought there was no future for me at Liverpool. So I went to see Bill Shankly and said I wanted a transfer. Well, he was shocked. He didn’t expect that. A 19-year-old by the name of Tommy Smith was getting restless, as well. Tommy had seen I had gone in and then he went in. It was in the papers that Matt Busby would take the two of us. Not really, no... We wanted to stay at Liverpool, but there was an offer there to go to Man United. The club said effectively no? It was United’s loss and Liverpool’s gain that Shankly realised he had to blood his youngsters. He calmed Lawler’s nerves inside his office and convinced him to stay. Shankly said: ‘I’ve got an idea. Leave it with me.’ So in the next few weeks Ronnie Moran was coming to the end of his career and Gerry Byrne was playing right-back. So he moved Gerry Byrne over to left-back and tried me at right-back. I just played nearly every game after that. I didn’t miss many games. Only about four in five years, something like that. The statistics back up Lawler’s claim and he made an impressive 316 consecutive appearances for Liverpool from 2 October 1965	to 24 April 1971. Lawler and Smith, for that matter, established themselves in the side in the 1964/65 campaign when Liverpool started their European adventure in Iceland, a campaign that finished in controversial circumstances in Italy. 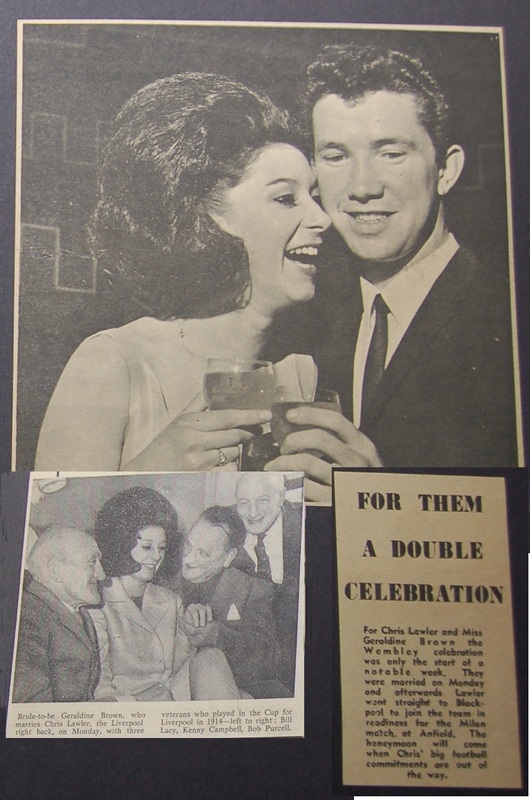 Chris’ wedding to Geraldine Brown on 3 May 1965 at St Paul’s Roman Catholic Church in West Derby was a big event in the city. All of Chris’ teammates were in Blackpool as the team was preparing for the first leg of the European Cup semi-finals against Inter Milan. 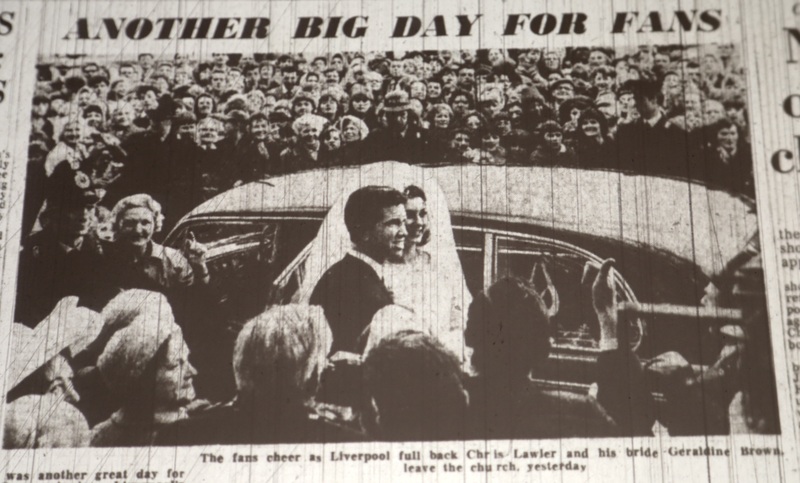 Ian St John and Ron Yeats were though in attendance and around 700 Liverpool supporters cheered Chris and Geraldine outside the church while 20 police officers kept everything in check. Poor Chris couldn’t exactly enjoy this memorable day as he had to be whisked off during the wedding reception to join his teammates in Blackpool while his bride stayed at her mother’s. Chris won the FA Cup in 1965, the League Championship in 1966, reached the Cup winners’ Cup final the same year and another FA Cup final in 1971. Life at Liverpool was anything but quiet especially as Chris and Tommy Smith were roommates. You had a good understanding with Tommy Smith who was centre-half on your side and Callaghan on the wing. When we started off there were no substitutes. So we played every week together, so we knew each other’s play. If I went forward Ian Callaghan would drop back or Tommy Smith. We all knew each other. Not like today when it’s a different team every week. Yeah, right... We probably have no evidence of the fairness of those tackles. [Smiles] Even tackling from behind was allowed. With whom did you most enjoy playing? All of them, because we all had a good spirit. Lot of players had faults. Tommy Smith didn’t get on with Emlyn Hughes. We all liked each other even for the faults we had. We were a good team. As previously mentioned Lawler got more than his fair share of goals and was especially prolific in the European competitions. Lawler was on target in the two defeats to Red Star Belgrade in 1973. Liverpool lost both legs 2-1. I always remember their goals; wonder goals. Shots from 35 yards going in at the angle. Ray Clemence was in goal then. He was a good keeper, but he couldn’t even save them. There were good goals that beat us. Lawler fails to mention that his Red Star equaliser at Anfield was very impressive. He chested the ball after a knock down by Toshack in the middle of the penalty area and volleyed the ball into the roof of the net without the ball ever touching the ground. Lawler's goal against Red Star Belgrade is at 6:04. The attacking right-back netted 41 goals in the first division and more often than not his goals were quite stunning. From a press report on Liverpool – Newcastle 1-1 on 6 April 1971. What is your most memorable goal? When we beat Everton. We were losing 2-0 and Steve Heighway scored and John Toshack. It was getting late on in the game. I only went up when needed. I ended up in the penalty area. Toshack flicked it on and I just controlled it and volleyed it in the back of the net. Everyone went mad. Five minutes to go. Karl “Wooltonian” Brodrick remembered this momentous occasion in Merseyside derby history that took place on 21 November 1970, in his “Derby Day Trilogy”. Shankly transformed the successful side of 1964-66 in 1970 as Liverpool had gone empty-handed for four and a half years and would remain so in the following season, just missing out on the title. Liverpool lost to Watford on 21 February 1970 in the quarter-final of the FA Cup which proved to be the last straw. Shankly had to change the old guard. "He dropped Lawrence, St John, Ron Yeats...," Lawler remembers. "There were some good youngsters coming up then; Larry Lloyd, Ray Clemence, Emlyn Hughes and Keegan, of course, Toshack, Heighway." Lawler kept his place and was a key player in the side that finished fifth in the league in the 1970/71 season 14 points behind Arsenal, who went to win the double when they beat Liverpool in the FA Cup final. Shankly praised his reliable right-back at the end of that campaign. Approaching his thirtieth birthday Lawler still retained the fitness and stamina to play in every single one of the 66 competitive games the club played in four different competitions during the 1972/73 season, his reward being further winners’ medals in the league and the UEFA Cup. Unfortunately Lawler injured his knee against QPR in November 1973 and was never the same player after that. There was more to that actually. I’ve never really told anybody. Only a few people know. I got injured at QPR. Bob Paisley was the trainer then. We came off and he put an ice pack on my knee to keep the swelling down. He put a bandage around it, but it was a chemical one, a packet... you shake it and there’s crystals inside it. He put it on my knee. He bandaged me up. On the train back to Liverpool I had to take the bandage off, it was like a burning sensation. So that was Saturday night. Sunday morning a specialist came to Anfield to have a look at my knee. I got on the medical table and he checked me and said: ‘Yeah, the cartilage has gone.’ Then he looked at the back of my knee. The ice pack had taken all the skin off. I had like third degree burns. I went straight into a private hospital. When I went to the hospital nobody bothered with me anymore. That’s how it was at Liverpool. You’ve had your cartilage out, left in a hospital and nobody comes to see you. Bill Shankly didn’t like anybody injured. I was in hospital for 4-5 days. I discharged myself and went home. I was just lying in the bed there waiting for this to heal. Eventually it healed and I had the cartilage operation. I never really got fit again. My kneecap kept collapsing on me. I should had my cartilage out straight away, but I had to wait five weeks. I don’t blame Bob Paisley. He wouldn’t do anything like that deliberately. It was a mistake. Lawler only featured in 17 matches in a season and a half following Bob Paisley’s appointment as manager as his Anfield career came to an end. On a personal level Chris and Geraldine suffered a horrible tragedy in 1975 when their oldest child Christell Rose died. They have three other children; Jane, Christopher and Leon. "Been thinking about this all day about how to describe my dad and what type of person he is and I keep coming to the same conclusion. I've got to say, without being biased, that he is the most warm, funniest down to earth man I have ever had the pleasure to know in my whole life. I couldn't have asked for a better father. I don't really think that the title of being classed as a quiet man does him justice to be fair. You have to know him personally to get to know the real person. I guess its because he's a proper gentleman and always speaks when spoken to first. Being very humble, he never really talks or either brags about his footballing feats. On occasions we'll be sitting watching Liverpool and he'll mention this time he got the ball on the edge of the box and volleyed it past the opposing goalkeeper etc. and then the next line of the conversation will be 'So whats for tea?' or 'Just won £3 on a scratchcard...yesss' It is examples like that when I look back and think, hang on a minute, wow...my dad played for Liverpool Football Club but then again...he's just my dad :) The best ever quote about my dad was when some gentleman came up to me and pointed at my dad and said "It was the best money i ever spent in my entire life watching him"...I really was made up with that and couldn't thank the man enough." In October 1975 Lawler moved to Portsmouth who were managed at the time by his former teammate, Ian St John. In the summer of 1976 Lawler played on loan at Miami Toros which was a unique experience. I played against Pele and Eusebio. It was all new then the league [The NASL]. I lived on an island; Key Biscayne, one of the little islands off Miami Beach. It was lovely. I rented a house off a lady from New York. I had my family with me. A testimonial was held for Chris at Anfield on 11 October 1978 with Swansea as the opposition. In 1980 Lawler wound down his playing career in a much colder climate in Norway. I was player-manager with Raufoss, who were in the second division. I was one season there and then I went to Bodø. I was just the manager two years there. I won the third division my first year at Bodø. In-between when I was at Bodø I’d come home for the winter and was assistant manager at Wigan for six months and then went back to Bodø. I didn’t stay at Wigan because the money wasn’t good. The Boot Room boys in 1984: Chris with Moran, Bennison and Evans. “The Silent Knight” returned to Liverpool FC in 1982 when he was appointed the coach of the reserve team. Bob Paisley was in his last season as manager and Joe Fagan took over. Lawler both experienced pleasure and pain watching Liverpool from the bench in the European Cup finals of 1984, where the Reds won their fourth European Cup and 1985 when the Heysel disaster was the last chapter in Fagan’s two years in charge and Lawler’s time at Liverpool, as well. Kenny Dalglish became manager and he wanted his own people in. He didn’t actually tell me... I found out from the cleaners that somebody (Phil Thompson) was taking my place. That was the only disappointing thing about it all. It wasn’t nice leaving Liverpool, but it could have been done better. I’ve seen Kenny [since then] and there is nothing now. No point in living in the past. Interview by Arnie Baldursson ([email protected]) Copyright - LFChistory.net. Thanks to Chris Wood for the transcription.